Research tells us that stories are 22 times more memorable than facts alone. There’s no question that when done well, brand stories are a powerful way to move both people and product – but is finding a tale to tell enough to ensure your brand lives happily ever after? Not anymore. Customers are looking for more authenticity and emotion than ever before. A real fairytale. We discuss how the new chapter of advertising is being written by the customers themselves, and how evolving your brand’s role from ‘storyteller’ to ‘storysharer’ can help you forge deeper connections. Humans love a good story. From the cavemen to the Kardashians, we’ve been spinning yarns for millennia. In fact, 65% of our everyday conversations are made up of personal stories and gossip. Over recent years, the word ‘storytelling’ has been buzzing its way around marketing departments and advertising agencies. Despite the ‘fluffiness’ of the word and the nostalgia it conjures, storytelling has hard-hitting commercial potential. No matter how honest, moving or human our brand narratives may be, the ultimate objective is to promote our brand, products and services. And there’s lots of evidence to suggest that storytelling provides a winning formula. The key is to make sure you’re telling the right story in the right way. Whether it’s Oxo family soap opera or Ikea’s Lion, there are plenty of excellent storytelling ads that have offered food for thought, laughter or pathos over the years. If you haven’t seen it, we can recommend The Canal Plus Bear, it’s one of our agency’s favourites. Emotion and memory are powerful partners. Research by Stanford Business School has found that people remember stories around 22 times better than facts. So it’s not surprising that when stories are used in advertising, they can have a marked influence on our buying behaviour. Not only do they help us remember brands better, the right narrative changes what we think about a product’s quality and value. In a study released last year, participants were shown two different adverts for a brand of Californian chardonnay. One ad had standard tasting notes, the other the winemaker’s story. The results showed that people were 5% more likely to opt for the bottle with the winemaker’s story – and significantly – willing to pay 6% more for it. It goes without saying, having a tale to tell based on genuine insight is a good starting place for any brand. But, in the words of Martin Weigel, “Ultimately it is not the story we tell that is important. But the story that the consumer tells about the brand. Whether to themselves, or to others”. In response to how our customers are now choosing to consume information, brands need to evolve new ways to tell their stories . In a recent survey of global customers, 87% of respondents said they want more meaningful interactions with brands. ‘Meaningful’ here translates as authentic, emotional and entertaining. In short, brands need to offer more in return for their attention. And once they have it, customers want to be invited in. This is what we’re seeing from a new breed of brand campaigns: an evolutionary shift from ‘passive’ to ‘active’ storytelling. The audience is not being told a brand story. Nike’s Nothing Beats a Londoner campaign is the perfect example of the new wave. And it has a pretty good story of its own. Nothing Beats a Londoner came about because Nike had lost touch with kids in London. Their brand meant nothing to them. It was just another big, faceless American company. They knew they needed to find a way to reconnect, and key to this was finding an authentic voice and a story (or stories) that rang true. And what better way to do it than getting 258 young Londoners to create their own portrait of their city? Every vignette featured in the ad is based on a real story. The opening scene, where a teenage boy talks about running two miles to get to training, is inspired by kids who said they run everywhere because they can’t afford the Tube. As a piece of storytelling it was compelling – a rich and original tapestry of experience, attitude and pride. As a marketing campaign it was inspired – each of young people involved launched the ad via their own social channels. This helped give the brand organic reach almost impossible to achieve on its own. Within 5 days of launching it had racked up 2.1m views on YouTube. Nike aren’t the only brand adding people power to their brand stories. 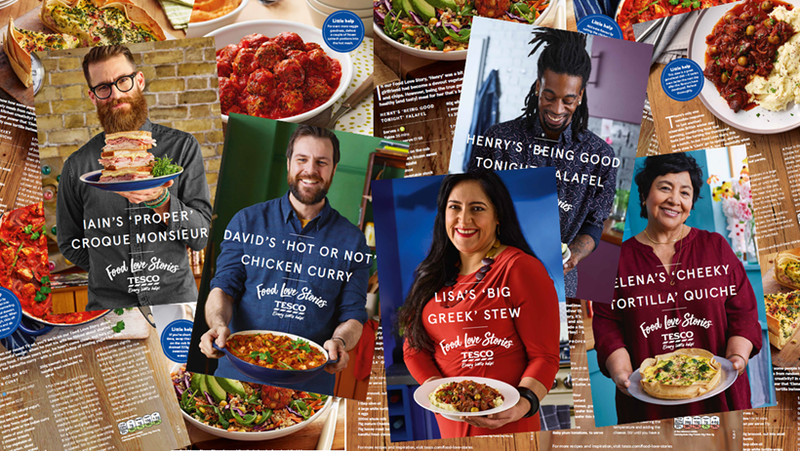 Tesco’s successful Food Love Stories campaign placed the customers at the heart of their marketing strategy. It marked a move away from their long-standing, value-led strategy, ‘Every Little Helps’, to a quality positioning expressed through real customer experience. The simplicity of Food Love Stories reflects the results seen in the Californian chardonnay research. By celebrating the food people love to make for the people they love, they found a distinctive way of taking about food quality in a crowded space. It also plugs into our emotions as people. What’s more enticing for a shopper browsing the aisles for mealtime inspiration? A recipe for ‘beef burgers’ or a recipe for Dee’s Fingers Crossed Paprika Burgers which comes with a heart-warming story about waiting for her son’s exam results? No contest. The audience fell in love with Tesco’s love stories. It served up one of Tesco’s highest profit ROIs in 2017. When Dinosaur was approached by The Gym to create a campaign for their newly launched LIVE IT membership, we knew talking about the additional benefits or the gym environment wasn’t going to provide the cut through they needed. Would hearing how you can access ‘unlimited fitness and body composition measurements’ get you reaching for your trainers? No, us neither. For many, going to the gym can be an intimidating experience. And if you’re out of shape, just the thought of young, perky twenty-somethings grunting on the weight machines is enough to have you running in the opposite direction. But hearing a real story from someone who conquered their fears and stepped through the doors of The Gym might just strike a chord. So we invited two members of The Gym, Harriet and James, to share their stories. Wobbly bits and all. In two candid, documentary style films, they chat about the personal challenges they’ve faced and their journeys to transform their health and wellbeing. The result is a powerful piece of brand storytelling that’s honest, authentic and 100% owned by the audience. Storytelling will always be one of the most powerful communication techniques we have in marketing. But can brands afford to keep running campaigns telling stories about themselves and expect the audience to keep listening? It’s like Dorothy skipping off down the Yellow Brick Road and hoping the Tin Man, Lion and Scarecrow follow behind. The new chapter of storytelling makes the customer – not the brand – the hero. It provides a platform and narrative framework for them to create, definite and share their own brand stories. The result? An authentic perspective, compelling narratives and powerful brand advocacy based on genuine human experience. All the ingredients for a best-seller. Storytelling in advertising is evolving. And to stay part of your customer’s story, brands need the recognise their role has shifted from being just ‘storytellers’, to ‘storymakers’ and ‘storysharers’ too. For more information on the storytelling we do, please read our LIVE IT campaign case study, or our Catch the Summer campaign for TfGM. If you fancy getting in touch to share a few stories, a cuppa and find out what we can offer your brand, send an email to hello@dinosaur.co.uk or call us on 0161 831 0831.